I clearly remember the first time I was arrested: it was a day after the night our school had been evicted. A referendum among the student body days before had resulted in a toma, a takeover of the school as a form of protest. The night before, students were detained and beaten in the dark once the TV cameras were gone. The next day, we reconvened in an assembly which resulted in a second occupation. 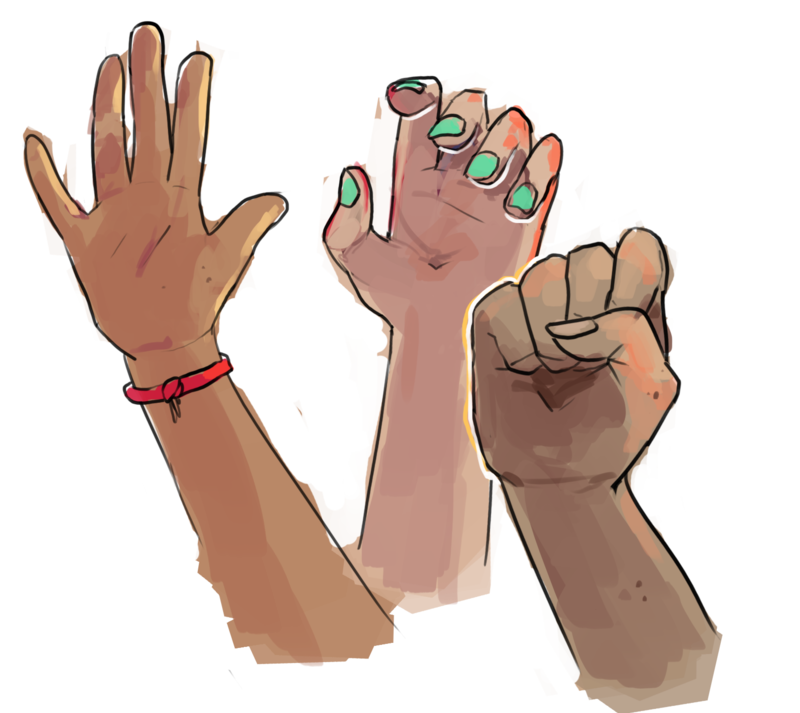 We decided to continue the takeover as an act of solidarity with our classmates who had been harmed. Two hundred and twenty-five students, most of us barely 16 years old, were arrested that day. The police station did not have enough space to hold us all, so we were kept for around 10 hours in a cage meant for motorcycle storage. Looking back, this punishment does not seem remotely as relevant as everything that led me to resist that day. I was dragged by two policewomen out of my school and the TV cameras recorded it all. I had seen police brutality before. I had the tear gas burn my eyes. I had ran from them in fear. I walked home soaking wet from the toxic water that the water cannon truck relentlessly shot at us. But I had also felt the adrenaline. I felt happiness, mixed with anger and conviction, as my friends and I walked down the main avenue singing protest chants. I felt a renewed understanding about my country's reality, about my family struggle, as I walked to the subway from school. The first time I spoke up in an assembly, my voice felt tremorous but strong to have found something to fight for. Something that felt like it was mine. That first arrest was no isolated incident. 2011 had seen the biggest wave of protest in Chile since the end of the dictatorship in 1990, and it was led entirely by high school and college students. I attended El Carmela, an all-girls public high school in Providencia, an upper-middle-class neighborhood in Chile’s capital. Like a few others, El Carmela was known as a path for low-income folks to access university, a beacon of social mobility. The nine-month-long occupation in 2011 shook the foundations of this system. Just like other prestigious institutions such as Instituto Nacional (the oldest secondary school in the country), and the main university, Universidad de Chile, El Carmela mobilized for a radical change in the mercantilist Chilean educational system. It had originally began with marches in early April 2011, when students and teachers gathered in Plaza Italia and marched down to the presidential palace. Similar acts took place across the country in a political process that dragged on until late November that year, and marches modeled around these actions continue today. Student federations led the marches, many of whose leaders became prominent political activists that year. While it may have seemed that little but our experience as students brought us together—marches were made of low, middle, and even high income folks of various ages—we were all unified under a single, structural demand: the constitutionally-guaranteed right to a universal education at all levels, based on a public, democratic, pluralistic, free, and efficacious system, oriented towards the needs of Chile and its peoples. It was the radicalism of this demand that turned us into a “doomed generation,” as posed by right-wing mayor Pedro Zabat back then. We were stubborn, confrontational, awake. While trying to battle the intransigence of our school’s administration, ordinary student council meetings turned into unauthorized assemblies of over a thousand students. Classes were disrupted by the need to respond to our country’s political moment. We improvised teach-ins on the Constitution and education policy. We discussed our own solutions and wrote our own petitions to the municipality. But the government was not listening. And the more we learned, the angrier we became. La toma was the most radical method for stating our demands. It meant a disruption of the system that could not be overlooked by the authorities. As schools are funded proportionally to student attendance, a takeover of school activities put dirct pressure on the municipality to respond by freezing government funding. The hope was that this message would translate into authorities pressuring the government to act. In April 2011, a delay on government scholarships left hundreds of low-income students food-insecure and unable to pay tuition. The student protests began with a statement from the Chilean Student Confederation (CONFECH) responding to this issue. But almost overnight, what started as a narrow protest spread across the nation, gathering the Chilean people behind three main demands: high-quality free education, de-municipalization of secondary schools, and an end to the for-profit education system. “The theories of Milton Friedman gave him the Nobel Prize; they gave Chile General Pinochet,” says Latin American writer Eduardo Galeano. The rise of the Unidad Popular in 1969 was a political breakthrough for the Chilean people. The UP was a leftist coalition that proposed a proletariat struggle through institutional change, and that successfully established the first democratically-elected socialist government led by Salvador Allende in 1970. This political revolution was short-lived, particularly under President Nixon’s orders to undermine the economic progress of Chile during Allende's leadership. On September 11, 1973, Chilean armed forces (supported by the CIA) bombarded the presidential palace, ushering a military dictatorship under General Augusto Pinochet that lasted until 1990. Reports suggest that this violent repression tortured and incarcerated 28,259 Chileans, assassinated 2,298, and disappeared 1,209. Of those disappeared, only 104 have been found and identified. Before the transition to democracy after the 1988 plebiscite, Pinochet had successfully implemented a new Constitution, which carved a path for a new free-market economy and an amnesty law, both of which remain today. He held a seat in parliament for four years after the return to democracy, and died in 2006, unpunished. In Chile, a free-market approach rules the education system—as it does for everything else. While often praised as an economic miracle by the international media, Chile’s economic growth has been sustained by the violent policies imposed in the 1980s under the military dictatorship. Economic reforms enacted by the Pinochet regime—under instruction of US economist Milton Friedman—privatized natural resources, including water, as well as the educational, health, and pension system to a degree unseen anywhere else in the world. This dynamic remained largely unchanged through the aided democratic transition of the 1990s. The recent student movements, led by the grandchildren of the dictatorship, have unraveled a crisis of legitimacy within this inherited undemocratic political system, unconcerned with the demands of the people. Chile’s rate of income inequality is one of the highest in the world, and the education system is this inequality’s backbone. The limited state involvement in the strengthening of public education deepens the inequalities every Chilean inherits from their families and the neighborhoods that they are born in. Public resources injected into education are distributed to public and private institutions alike. In this context, while private institutions’ enrollments increase, public institutions’ enrollments decrease proportionally, as the popularity of charter schools is boosted through the promise of better infrastructure and higher quality education. Public schools then are proportionally underfunded, directly affecting the learning and opportunities of the most vulnerable children and youth. Primary education, schools, and funds are administered by municipalities, creating a cycle where poor neighborhoods have the least access to quality instruction. This further draws middle income families into voucher programs and private schools. Public spending on higher education is among the lowest in the world at 0.5 percent of the country’s GDP. There is not a single public university in Chile, and the system allows for higher education institutions to profit without limits. These sky-rocketing costs and lack of quality in education translate into an almost 50 percent drop-out rate, particularly impacting first-generation and low income students. It was anger at this injustice that brought students into the streets. It was a duty to reclaim the hope our parents had lost decades earlier. As the movement dragged on, repression got worse. On days of protest, anyone wearing a black and white school uniform was targeted by police. There was tear gas attacks and beatings in Santiago’s main avenue, La Alameda, at least twice a month. Human rights abuses, particularly against high school students, were denounced by international organizations like Human Rights Watch and UNICEF. But it was clear that the students carried dreams larger than just their own. After two months of mobilization, 82 percent of the population supported the protests, while approval of the government was at 26 percent, a historical low. It is not only the Chilean student movement's popularity that is exceptional.. The structures of political organizing that arose in 2011 marked a point of rupture within bipartisan politics. It was a time for street politics. It was a sixteen-year-old student, the spokespersons for the National Coordinator of Secondary Students (CONES), sitting at a table with the president, bargaining over education policy. It was people living inside schools and universities across the country, keeping the movement alive. It was turning the streets, public transport, any available space into a space for discussion and critique of this inherited political and economic system. More than appealing to a greater power, students throughout the country appealed to the solidarity of their peers and of the people. The movement needed to be resourceful because we were working with so little. As the intransigence of the government increased and its complicit media turned against us, our spaces were limited. During the nine months my school was occupied, the grey building became the hub for so much more than a petition on free, quality, universal education. It was a space for collective freedom. We had workshops on sexual health, indigenous medicine, and art techniques. We prepared for police brutality in the community. In the mornings there were assemblies to set the agenda for the day. Some folks were up before that making breakfast with whatever was left in the school’s kitchen, and to feed those who had slept over in the empty building the night before. The winter was unforgiving as we stood in the cold going over updates on the political climate: assemblies, arrests, threats, disagreements, events. We would set up committees to revise government policy, and edit the petition that was presented on behalf of the movement. We had people in charge of fundraising to sustain the occupation, as well as outreach, cultural, and security committees. I was a freshman back then and my politics were not yet solidified, but I didn’t need them to be in order to understand that this was a crucial moment for me and for the country. It was a process of claiming a dignity that we had never experienced before. As put by one student activist back then: “The issue is not just with education. It’s with politics, with the institutions, with the culture.” It felt like a generation asserting the sovereignty that had been stolen from us decades before. The communitarian nature of the student movement disrupted the ideas of guarded democracy and political unaccountability the dictatorship had forcibly built into the country. For months, it was a horizontal dialogue between the government and the students: from universities, as well as voucher and municipal schools across the country. Government policy proposals that were negotiated with representatives of the movement were brought into regional and local assemblies for discussion and evaluation. No political party was involved. This was a reminder that democratic governance is meant to be a conversation between the people and their representatives. PAULA PACHECO SOTO B’20 prefers street politics.